The first part of this series, The Polar Horoscope, was written as a one-off paper, concerned solely with the trigonometric determination of the angles in a circumpolar horoscope. It did not fully explore the more challenging aspects of upper and lower culmination, leaving instead an open question that will now be addressed. This paper continues examination of the semi-arc system, its application in the Polar regions and relationships between the method and the diurnal and seasonal cycles. [Additional note 2008: This paper is the longest and most difficult of the series. It is also the most likely to cause the reader some 'cognitive dissonance' as it takes us into uncharted waters. The issues addressed, here and in the next part, were left unexplored by Otto Ludwig, who proposed the Placidian circumpolar solution. The writer had at first hoped to avoid discussing the relationship between a horoscope's angles and the seasons of the year but such became inevitable. A dry mathematical exposition would not alone suffice. Circumpolar MCs found to the north of the observer do not represent that which those to the south represent. The difference is inherent in the fact that one circumpolar day lasts up to six summer months, just as one night at a Pole will last all winter. The summer Sun, unable to set within the normal 24 hour period, swings all the way round the field of vision, passing over the 10th house semi circle  not once, but twice. It is highest in the sky when culminating to the south, and lowest when crossing the 10th again, to the north, where it dips closest to the horizon. Since the same is true of any zodiac degrees that cannot set at Polar latitudes, how may we distinguish between their twice daily culminations? No such problem occurs in horoscopes between the Polar Circles, where lower culmination always occurs below the horizon, at the IC; but within the Polar Circles any degree constantly above the horizon will mark the 10th house at each culmination. The problem is not in this case due to the local disposition of the Ecliptic, but to a failure of the houses themselves. Few quadrant systems will make this distinction between upper and lower culminations, within the Polar Circles, other than to present a 'retrograde' Ascendant when the MC is to the north. The foregoing remarks apply only to systems such as Campanus or Regiomontanus, which use the entire upper North/South Meridian - from the South Point of the horizon to the North Point - to divide the 9th and 10th houses. This trigonometric approach will usually generate a normal-looking circumpolar chart but, when an Ascendant is in reverse, it will also present an astronomically false picture of the sky. When the Sun's lower culmination is visible to the north, it is in principle at the circumpolar equivalent of the IC, not the MC. Likewise, Ecliptic degrees that culminate to the north cannot rightly be said to represent upper culmination, which is the orthodox role for a degree at the Midheaven. Distinction must be drawn between the idea of lower culmination, as represented by the IC, and the celestial space occupied by the 4th house, which in temperate horoscopes always commences at the IC. In the example above, the Sun never enters the 4th house because it cannot set. The Campanus system will not therefore depict or otherwise register its continuing lower culminations until some later date, when the Sun has set and can once again cross the lower Meridian to enter the 4th house. Likewise, the lower culmination of any zodiac degree permanently above the local horizon cannot be registered. Meanwhile to the south - where the MC of a northerly horoscope is usually located  - the culminating degree is found below, not above, the horizon (see first illustration). It is perhaps this issue above all others that has drawn the most comment and debate in respect of circumpolar horoscopy. While the trigonometry of Campanus or Regiomontanus demands that the northerly degree be presented as an MC, astronomical principle suggests the southerly, even though this degree is below the horizon. Astrologers have debated the case for each but have not always considered the root of the problem; that the culminating degree has parted company with the 10th house. As such, argument is futile since both sides are correct according to their own point of view. In truth there can be no 'Midheaven' degree, as this is usually understood, because none is available when the Ascendant is in reverse. The semi-arc system does not present the same dilemma as it is not composed of rigid great circles. As we saw in the last paper, the method is informed solely by the apparent motion of the heavens (as determined by the geographic latitude of the observer). This principle is applicable anywhere on Earth but it will on occasion produce circumpolar horoscopes that stray some distance from the orthodoxies of astrological charts drawn up for temperate latitudes. That there are 12 houses, six above the local horizon and six below. That these houses are obtained by dividing every diurnal and nocturnal arc, from Pole to Pole, into six sections of equal length. With Campanus or Regiomontanus, all houses start and/or finish at the North and South Points of the horizon. In contrast, semi-arc houses 7-12 start at the South Point and finish at the North Pole, while houses 1- 6 run from the North Point to the South Pole. With this arrangement the upper North/South Meridian is divided into two sections. The first, from South Point to North Pole, represents upper culmination, divides the 9th and 10th houses and therefore generates the 10th cusp/MC (see third drawing). The second section, from North Pole to North Point, represents lower culmination, but not the 4th cusp as it does not divide the 3rd and 4th houses. As the fourth drawing shows, the Sun conjoins the Meridian at a point that separates 7th from 12th, rather than 9th from 10th. This section, which at once represents houses 1 - 6 whilst omitting them, will therefore reflect lower culmination, or the IC, but without the 4th house space with which this is usually associated. Only in this way can there be any reconciliation between the astronomical fact that is lower culmination and the astrological requirement that the 4th house is always found below the horizon. This reconciliation, though the only satisfactory solution to the problem, raises a further question. As shown in drawing 4), the Ecliptic crosses the Meridian at a point not associated with either the 10th or 4th houses. An Ecliptic cusp is created but it cannot be that of the 10th or 4th. Clearly, this cusp is also an angle of the horoscope; but it is not a Midheaven or Imum Coeli in the familiar sense. Houses shown below the horizon include the section of lower Meridian that represents the omitted upper houses and marks upper culmination, but not the 10th house. This section, from South Point to South Pole, divides the 6th and 1st houses and therefore presents one edge of the 1st house (the other edge being the eastern horizon). With the Ascendant in reverse, roughly to the north-east, and no Midheaven in the familiar sense, the semi-arc system passes custody of the culminating degree from the 10th to the 1st house. This means that the 1st house now has two Ecliptic cusps - one representing ascension, the other upper culmination - while the 10th house has no cusp at all. Planets with much northerly latitude will, together with northerly circumpolar stars, continue to occupy the 10th but this house cannot be marked in the Ecliptic. Moreover, when the 10th house has no Ecliptic cusp, neither has the 4th house. When upper culmination occurs below the southerly horizon, lower culmination must occur above the northerly horizon, between the 7th and 12th houses (see The Polar Arcs, 2nd & 3rd diagrams). When the Ascendant is in reverse, the 4th house, like the 10th, has no Ecliptic cusp, and the 7th house, like the 1st, has two; one representing lower culmination and the other the descending degree. While the horoscope retains all four cardinal points, these are now generated by two cardinal houses rather than four. This feature, together with the absence of 4th and 10th house cusps, may seem anomalous compared with horoscopes cast for temperate latitudes but it is by virtue of such phenomena that the method provides a faithful reflection, not only of the circumpolar heavens but also of the seasons of the circumpolar year. Seasons are determined by astronomical factors as well as geographic location. They are caused by the tilt of Earth's axis to the plane of its orbit; the obliquity of the Ecliptic. Without this obliquity Ecliptic and Equator would coincide, making horoscopy much simpler, but without the seasons life on Earth could not flourish as it does and with such manifest diversity. The houses of the horoscope concern life under the mundane sphere and in the course of any 24-hour period the angles of the horoscope model the entire seasonal cycle. Ecliptic degrees occupied by the Ascendant and MC are usually degrees occupied by the Sun at other dates in the year, while changes in the angular relationship between these degrees are determined by geographic latitude. These changes occur throughout every 24-hour period and become more and more extreme at ever higher latitudes. We must therefore expect some omissions and inversions when, in the absence of a circumpolar sunrise, the distinction between the day and the year becomes increasingly unclear. Near the Equator, the Sun always rises in a more or less easterly direction and at a steep angle to the horizon. Dawn and dusk are therefore very short, as the onset of daylight or darkness occurs rapidly. Night and day are always roughly equal and there is little difference between the seasons. These regional characteristics are reflected in horoscopes by the angular relationship between Ecliptic degrees occupying the Ascendant and MC. The angles of the chart are rarely far from 90 degrees apart at these latitudes. Exactly at the Equator, mid-summer occurs when the Sun occupies 0 Aries or 0 Libra, degrees which in contrast mark the beginning or end of the warmer months in temperate climes. Above the Tropic of Cancer the seasons assume the annual cycle. Seasonal variations begin to increase, as reflected by the differing lengths of night and day, the lengthening periods of dawn and dusk and the increasing range of geographic direction in which sunrise may occur. The North/South Meridian is always at a right angle to the horizon but as geographic latitude increases so does the amount by which the Ascendant and MC can deviate from 90 degrees to each other in the Ecliptic. At the Poles, night and day each last six months, meaning that the Polar diurnal cycle lasts an entire year rather than 24 hours. No stars rise or set and Earth's rotation does not bring the Sun over the horizon. Rather, daylight occurs when the Sun crosses the horizon due to its changing declination. Once visible, the Sun revolves around a northern Polar observer as it climbs higher in the sky. When after three months it reaches 0 Cancer this ascent ceases and is followed by three months of slow spiralling descent. Six months of 'night' ensue as the Sun enters Libra. Between the Pole and the Polar Circle, conditions vary. Months of 'night' may be followed by a few weeks of spring, during which the sun rises and sets within 24 hours, followed by the months of 'day' that can constitute a circumpolar summer. A few weeks of autumnal sunrise and sunset ensue, followed by a return to the unbroken darkness of winter. Circumpolar years such as this include extremely long periods of dusk and dawn, some of which are unaccompanied by sunrise or sunset. As spring approaches the light of dawn may be seen, to the south, but it does not always precede a sunrise. 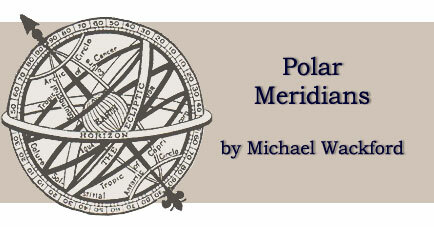 At the end of a circumpolar winter, the first appearance of the Sun is partial, relatively brief and astrologically ambiguous, but it provides the first hint of the link between the southerly Meridian and the Placidian 1st house. In extreme northerly latitudes the Sun first appears exactly at the South Point of the horizon, meaning that the visible part of the Solar disk straddles the 1st and 10th house boundaries as it simultaneously rises and culminates. This is reflected in horoscopes by a daily conjunction of Ascendant and MC, which occurs in the same Ecliptic degree occupied by the Sun on the day the centre of its disk conjoins the South Point. The Sun gains altitude with each successive appearance as it rises a little farther to the east of due south and sets farther to the west. It continues to straddle horizon and Meridian until its lower limb is also visible above the South Point. Thereafter, and throughout the days of spring, the geographic direction of the sunrise sweeps northward along the Eastern horizon, as the westerly sunset occurs ever farther to the north. Circumpolar summer commences when sunrise and sunset conjoin at the North Point, a moment that is also reflected in horoscopes by the second daily conjunction of Ascendant and MC. Likewise a link between the northerly section of the Meridian and the Placidian 7th house is established when sunset fails to occur above the North point of the local horizon. The distinction between night and day is both clear and regular between the Tropics and while the seasons differ little, they do not follow the clear sequence experienced elsewhere. Above the Polar Circle the seasonal cycle could not be more apparent, but here night and day do not always follow the familiar 24-hour cycle. At the Equator midsummer occurs with the Equinoctal degrees, three signs removed from 0 Cancer. Throughout the year, and regardless of location or the lengths of day and night, Earth continues to rotate once every 24 hours, carrying with it the local horizon. This daily rotation of the horizon generates the four angles and the 12 Placidian houses, while the tilted Earth's annual revolution of the Sun generates the Ecliptic's 12 signs and the four seasons. In temperate latitudes the entire year, as expressed by the disposition of the Ecliptic, follows the 24-hour cycle of houses. Each degree passes through every house as, in the course of one night and day, it rises, culminates, sets, culminates below the horizon and then rises again. Above the Polar Circles, degrees that rise and set also follow this 24-hour cycle. These are degrees occupied by the Sun during a circumpolar spring or autumn, when it also crosses the horizon and passes through all 12 houses. Sections of the Ecliptic that represent the Sun's positions during a circumpolar summer or winter do not follow the houses in this way. That the semi-arc method reflects these culminations with the 1st and 7th houses, rather than the 4th and 10th, is yet another signature of the seasons. When, for example, a 'winter' degree culminates below the horizon to the south, it has come as close as possible to the horizon before falling away. Twelve hours later, with the Ecliptic again rising normally, the opposing 'summer' degree reaches upper culmination and marks the 10th as an MC. The difficulties associated with circumpolar horoscopy have often been met with arbitrary trigonometric substitutions that do not really solve the 'problems.' Sometimes the horizon is replaced ad hoc by the Meridian or Prime Vertical, for example, or perhaps the Ascendant is replaced by the East Point when no single degree rises. The obvious drawback to such suggestions is that there can never be any clear indication as to when or where one great circle should be discarded in favour of another. So while Meridians are added within the semi-arc system, they are generated within the method itself. Moreover, geographic latitude and the disposition of the Ecliptic determine when they are used, meaning that any substitution is made by the system, not by the astrologer. When this generates two Ecliptic cusps for both the 1st and 7th houses, however, the method raises questions with regard to house or chart rulership and to how the horoscope is drawn up. A few minutes later the MC joined the Ascendant in 10½ Scorpio, at the South Point (after which 10½ Taurus became the Ascendant a little to the east of north). From this moment and for seven hours thereafter, part of the Ecliptic rises in reverse as the geographic point of ascension travels from north to south, around the eastern horizon. When the rising degree again reaches the South Point, meeting the culminating degree in 19½ Aquarius, ascension switches back to 19½ Leo in the north, with the Ecliptic again rising directly. While the Ascendant was in reverse, the North/South Meridian passed through degrees of the Ecliptic that cannot rise at 75N, marking their culmination at one edge of the 1st house. As depicted in the fifth drawing, the structure of the houses and the disposition of the Ecliptic determine that for seven hours this Meridian forms the leading edge of the 1st house. By 2:00AM on the 13th June 2001, for example, the Ascendant was backing into the last degree of Aquarius as the advancing Meridian reached 20 Capricorn. In such circumstances it is arguably the Meridian that represents the leading cusp of the horoscope - the horoskopos or first "place" - the point where Ecliptic and Mundane Spheres meet. Between the Polar Circles, the rising degree always provides this point, but with the Ascendant in reverse is that role now called into question? The intention of this series is to describe - not prescribe - and the writer hesitates at the idea of usurping the Ascendant, not least because of the undoubted importance of the local horizon. However, the North/South Meridian is generated by Earth's rotation of that horizon, so to use it as the principle cusp of the 1st when - and only when - the Ascendant is in reverse would address another of the Polar region's horoscopic limitations. At 75N less than two-thirds of the Ecliptic can rise and half of these degrees (from 10½ Taurus back to 19½ Aquarius) ascend in reverse. With most other methods of domification, including Equal House, the rest of the Ecliptic can never represent the 1st house. At 75N, this includes Gemini, Cancer, Sagittarius and Capricorn in their entirety and, at higher latitudes, Taurus, Leo, Scorpio and Aquarius as well. As we approach a Pole, the range of possible Ascendants is limited to just a few degrees of the Ecliptic, either side of the equinoctal points. In terms of the 1st house this is perhaps appropriate, given the nature of the region, but the semi-arc method offers an alternative that warrants consideration. The North/South Meridian with the reversing Ascendant as co-significator: Or perhaps that Ascendant with the culminating degree as co-significator. Though untidy, this approach offers the horizon the widest possible range of Ecliptic cusps. At 75N, and in the order of the signs, these cover 19½ Leo to 10½ Taurus. The North/South Meridian alone: In the foregoing example, degrees traversed by the reversing Ascendant - 19½ Aquarius to 10½ Taurus - would be ignored, leaving half of the Ecliptic unavailable to the 1st house. At Murmansk (68N57), for example, the Ecliptic rises directly between 25 Cancer and 4 Sagittarius. Thereafter, the Meridian would represent the 1st house from 4 Sagittarius to 25 Capricorn, with ascension then recommencing at 25 Cancer. Though unequivocal, this option ignores the relatively wide range of degrees (25 Capricorn to 4 Gemini) that rise in reverse, but it makes all 180 degree polarities available to the 1st and 7th houses. The Eastern Horizon alone: As indicated, this is the only option available to most methods of domification but it is also the most restrictive. Nearer the Pole, only a few degrees of Virgo and Libra rise over twelve hours followed by their opposing degrees, which ascend in reverse for another twelve hours. While the first and second options make the entire Ecliptic available to the 1st and/or 7th houses, both are however subject to a similar limitation. Near the Pole, and under option 2), it will take almost twelve hours for just a few degrees to mark the 1st house with an Ascendant, followed by twelve hours during which almost six entire signs traverse the 1st house Meridian. However uneven this may appear, it is also a reflection of circumpolar seasons and skies and the imbalance is almost entirely mitigated nearer the Polar Circles under option 1). Options 1) and 2) are offered as suggestions for research. Their validity or otherwise cannot be determined other than by experience. Coherent methods of quadrant house division are first and foremost divisions of celestial space. Their subsequent divisions of the Zodiac - the Ecliptic cusps - indicate which section of the Ecliptic is contained within each house. Regardless of geographic latitude, the semi-arc system always divides the celestial sphere into twelve houses of equal celestial space but it does not, as we have seen, always generate twelve Ecliptic cusps in the Polar Regions. The example chart, first used in The Polar Horoscope and repeated in this paper, is an extreme example of such omissions. As may be inferred from drawings 3) to 5) above, the 'corners' of the 2nd and 8th houses both touch the Ecliptic, generating two cusps for each of these houses. There are however no other intermediate Ecliptic cusps in this chart. While all planets continue to occupy various houses of the horoscope, the Ecliptic gives little indication of their house positions, accurate or otherwise. Again, the absence or doubling of intermediate cusps does not however indicate that there are two houses rather than one, nor that a house is absent. Yet again, both are due to the way in which the disposition of the Ecliptic reflects the seasons of the circumpolar year. A few minutes after the example chart, latitude 75N temporarily had no intermediate cusps at all. Within the northern Polar Circle, no intermediate houses touch the Ecliptic when 0 Capricorn is near the Meridian. The Sun occupies 0 Capricorn at the middle of a northern winter, so when 0 Capricorn culminates below the southern horizon, the disposition of the Ecliptic reflects the middle of an Arctic winter, when all natural activity is at its lowest ebb. Appropriately, the entire Ecliptic is at that moment contained within the 1st, 6th, 7th and 12th houses. The same applies with regard to an Antarctic mid-winter, but when 0 Cancer culminates below the northerly horizon. The semi-arc system exhibits one other unusual feature within the Polar Circles, but at a limited range of latitudes and sidereal times. Due to the non-circular shape of the intermediate house-boundaries it is possible for one of these lines to weave across the Ecliptic, creating two or perhaps three Ecliptic 'cusps' for just one house. This occurs during brief moments when two or three degrees are simultaneously one- or two-thirds of the way along their semi-arcs  but again this does not infer any ambiguity of house position. This feature, while unique to the semi-arc system, is an accurate reflection of the heavens and the seasonal cycle at a few circumpolar latitudes. The method fails only insofar as it cannot pretend that the circumpolar skies, seasons, days and nights - and the apparent motion of the circumpolar Sun - are all similar to those witnessed in temperate or Equatorial regions. Unlike the systems of Campanus or Regiomontanus, it will not therefore produce circumpolar horoscopes that always resemble those cast for latitudes between the Polar Circles. Such charts are possible under these methods but their constructions imply and require that the Sun always rises once a day and that the entire Ecliptic ascends over 24 hours. Where this is not the case, both are at times forced to counteract by presenting a degree at lower culmination as an MC. A similar dilemma confronts the Equal house division in these regions and this will be explored in the next part, as will the depiction of semi-arc horoscopes cast for moments when the Ascendant in reverse. The Polar Arcs stated that semi-arc tables compiled by Magini and used by Placido de Titi were not publicly available. Following publication of that paper the writer received a copy of Robert Powell's History of the Houses, which contradicts this impression. Subsequent correspondence with Mr Powell confirmed that: "Magini published his TABULAE PRIMI MOBILIS in Venice, 1604. But his method is best explained in the much more comprehensive work PRIMUM MOBILE, DUODECIM LIBRIS CONTENTUM which was accompanied by a vast set of tables of TABULAE GENERALES AD PRIMUM MOBILE SPECTANTES (Bologna, 1609)." Placido de Titi had access to these tables but deliberately chose a shorter form for his own book. The tables appended to Primum Mobile use trigonometry, which is less accurate but much more concise. Many thanks to Dr. Jean Flower, for her invaluable mathematical advice, and to Dr. Robert Powell for information concerning Magini. Thanks also to Michael Edwards QHP, who suggested a number of choice phrases for this paper and indeed for the series. 1 ] Or upper North/South Meridian. 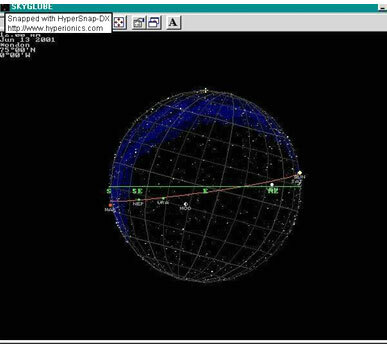 2 ] Astronomical computer programs such as Skyglobe greatly assist in understanding the celestial sphere and diagrams 1) to 4) have been checked against Skyglobe version 3.5. It should be noted that these 'exterior' perspectives cannot be obtained from version 3.6 and may not be available in later versions, unseen by the writer. 3 ] Northerly horoscopes cast for latitudes between the Equator and the Tropic of Cancer can have MCs to both north and south, as can those in the southerly Tropical zone. Southern temperate latitudes always find MCs to the north. 4 ] For the writer, the earliest manifestation of this debate occurs in Alan Leo's 1001Notable Nativities, first published in the early years of the 20th century. Discussion concerned the chart of Marie Peary, daughter of the Arctic explorer, whose data had been meticulously recorded by her father. She was born in 1893 at latitude 77N44, while the Ascendant was in reverse. Leo's comments are not well developed but it seems those around him could not agree whether her MC/10th cusp was to the south or to the north. Leo then invited "a symposium of astrologers" to settle the matter but its conclusions were not to hand as his book went to press. That agreement was ever achieved seems unlikely, given the arguments available to both sides. 5 ] This statement applies to the Northern Hemisphere only and should be reversed in respect of southerly horoscopes. 6 ] While it is easy to depict the apparent motion of a single point of the Ecliptic at the Polar Regions, the apparent motion of the entire Ecliptic defies facile description. Bernard Eccles has likened that motion to that of "a drunken hula-hoop" and any further qualification of his apt remark is beyond the wit of this writer. Again, Skyglobe or another astronomical program should be consulted in this regard. 7 ] Between the Tropics, the Sun passes overhead when its declination matches the geographic latitude of the observer. At 19N for example, this occurs when the Sun occupies 25 Taurus or 5 Leo. 'Mid-summer' thus occurs there twice, once in mid-May and again at the end of July, with the Sun culminating slightly to the north during the intervening 2½ months. At this latitude, and indeed throughout the Northern hemisphere, mid-winter occurs once toward the end of December when the Sun enters 0 Capricorn. At 19N, mid-winter is thus separated from a mid-summer by approximately 5 months to either side, with the entire cycle containing two indeterminate 'autumns'. This arrangement bears as little resemblance to the seasonal cycle of the temperate zones, as does the cycle found near the Poles. 8 ] In the Northern Hemisphere the analogy between the 1st house and spring or 0 Aries is clear but that between the MC/IC or Cancer/Capricorn and mid-summer is always inverted. This is due to the reverse order of signs and houses in the horoscope. 9 ] In these circumstances it is no longer possible, for example, to draw an analogy between the angles of the horoscope and the time of day. In temperate latitudes the ascending degree can be likened to sunrise, or perhaps '6:00am,' and the MC to noon. Likewise the Descendant has been compared with sunset, or 6:00pm, and the IC to midnight. Clearly this analogy breaks down in the Polar regions whenever the Sun does not cross the horizon, nor can it be applied in respect of degrees of the Zodiac that never rise or set. 10 ] In Northern European charts with Pisces or Aries rising, for example, the Moon's Ecliptic degree may appear well below the Ascendant of a chart when the Moon itself has already risen into view. Indeed, it is not uncommon for a 'Moon in Aries' to cross the horizon as a Piscean degree rises, or vice versa. Koster has also described a further serious shortcoming of the Placidus system which he terms the 'Placidus Foldover.' Owing to the ascending/descending oscillation in polar regions there are two opposite areas of the zodiac where three distinct points satisfy the Placidus semiarc criteria. In the Placidus chart these points must coincide, hence at that point there are 3 different degrees and a foldover of the zodiac, ie at that point the zodiac goes direct, retrograde, then direct again. The extent of the foldover can vary from nil to a sign or more. If a foldover includes a house cusp then the cusp has 3 different degrees on it; if it includes a planet then the planet is in effect in 3 places at once. In or out of context, such terminology is never helpful to the reader and the final assertion is always wrong in respect of Placidian houses. A planet can never tenant two or more semi-arc house positions, nor will it occupy two or more Ecliptic degrees. Such ambiguity of position occurs only when these two frames of reference are mingled, as seems to be the case with the above. Signs and (quadrant) houses are - or should be - two separate and independent frames of reference and it is mistaken to assess one in terms of the other. A most unlikely alternative to this interpretation is that Koster was criticising a makeshift trigonometric version of Placidus, which, like the Koch or Topocentric systems, will indeed place a planet in more than one house. 12 ] Regrettably, precise details as to when and where this phenomenon occurs cannot be included in this paper. The connection to the seasonal cycle will be reviewed once these details are known. Enquiries are underway and it is hoped they will be available as the series concludes. Koster may have provided some indication but this writer has for decades failed to obtain a copy of his book. Dean, Geoffrey, and Arthur Mather (1977) Recent Advances in Natal Astrology, Analogic, Western Australia. 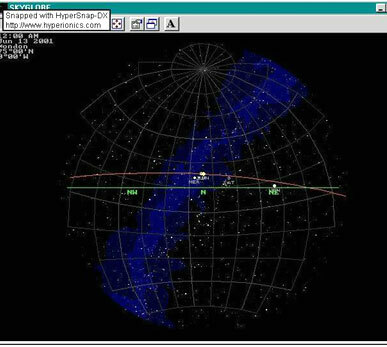 Haney, Mark A., (1992) Skyglobe, v 3.5, KlassM Software, Michigan. Koster, H, (1975) Astrological House Systems, Bannister Associates, Still River, Ma. Leo, Alan, (reprinted.1978) A Thousand and One Notable Nativities Health Research, California. North, J. D., (1986) Horoscopes and History, The Warburg Institute, University of London. Powell, Robert, (1986) All About Astrology, number 19, ACS Publications, California. And in that part of the earth where the equator is in the zenith, the whole of the fixed stars are found to rise and set, and to be above as well as below the earth, once in each revolution; because the situation of the poles of the equator, being in this manner on the plane of the horizon, thereby prevents the constant visibility or invisibility of any one of the parallet circles. But in other parts of the earth, where the pole of the equator is in the zenith, the fixed stars can never rise nor set; because the equator is then on the plane of the horizon, and circumscribes the two hemispheres (which it thus creates, one above and the other below the earth) in such a manner, that in one revolution every star must twice transit the meridian, some of them above, others below the earth. In other declinations, however, between these extreme positions of the equator, as just mentioned, there are certain of the circles always visible, and others never visible: consequently the stars intercepted between the first of such circles and the poles (ie - the northerly circumpolar zone - mw) can neither rise nor set, but must, in the course of one revolution, twice transit the meridian; above the earth, if said stars be on a circle always visible; but below the earth, if on a circle never visible. The other stars, however, situated on the greater parallels, both rise and set, and are found in each revolution once on the meridian above the earth and once on that below the earth. © Michael Wackford. Published online March 2008. This article was published in Correlation 21 (2) 2003; pp.22-36.